The Packard Fellowship program this year recognized 18 of the nation’s most innovative young scientists and engineers and provides each fellow with an unrestricted grant of $875,000, allocated over a five-year period. The support is designed to give talented young researchers an opportunity to explore new frontiers, take risks and follow uncharted paths that may lead to important discoveries. The award was announced today by the Packard Foundation. “The Packard Fellowships are an investment in an elite group of scientists and engineers who have demonstrated vision for the future of their fields and for the betterment of our society,” said Lynn Orr, a professor at Stanford University and chairman of the Packard Fellowships Advisory Panel. 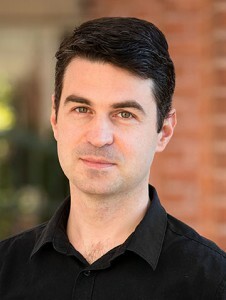 Ménard is currently working with graduate students and postdoctoral fellows on a new technique to estimate the distance of galaxies. He said observing galaxies is fundamentally a 2D process: we see them on the sphere of the sky, but that does not tell us how far away each of them is. As a result, said Ménard, astronomers have had to use approximate relationships linking the apparent colors of galaxies and their possible distances. But he said this technique, called photometric redshift, is not always accurate and does not work with all types of objects. Ménard said this technique has a huge potential because it brings the third dimension into the game. Knowing how far away an object in the sky is located is important, he said, because looking far away is seeing back in time. Therefore, he added, observing galaxies at different distances allows scientists to study how the universe evolves with time. Ménard’s interest in astronomy dates back to his youth, gazing up at the night sky while growing up in France. He studied in Paris and then earned his PhD working at the Max Planck Institute for Astrophysics in Germany and the Institut d’Astrophysique de Paris. Subsequently, he was a postdoctoral member at the Institute for Advanced Study in Princeton, N. J. and a senior research associate at the Canadian Institute for Theoretical Astrophysics in Toronto. In addition to being on the faculty at Johns Hopkins, he is a joint member of the Kavli Institute for Physics and Mathematics at the University of Tokyo. His research has led to the detection of gravitational magnification by dark matter around galaxies, the discovery of tiny grains of dust in the intergalactic space, and a better understanding of how light rays propagate throughout the universe and how gas is distributed around galaxies. Since he joined the Johns Hopkins faculty, Ménard has been recognized with several honors. He received the 2011 Henri Chrétien grant, awarded by the American Astronomical Society. He was named the 2012 Outstanding Young Scientist of Maryland, and he is the recipient of a 2012 Sloan Research Fellowship. Color digital image of Brice Ménard available; contact Phil Sneiderman.